Valentine’s Day is celebrated on February 14th, but on Instagram, #valentinesday began outranking other hashtags well before the holiday, as brands tried to get as much mileage as possible from their Valentine’s Day 2018 influencer campaigns. The day of love, romance, and, of course, gifts for loved ones is the third-largest consumer holiday in America. The National Retail Federation predicts that Americans will spend up to $19.6 billion on Valentine’s Day 2018 gifts and celebrations, and the holiday spending can result in a first quarter revenue boost for many consumer companies. With its heart-shaped like button, Instagram is a natural match for Valentine’s Day. Using InfluencerDB, we found some interesting statistics on three different Valentine’s Day 2018 influencer campaigns on Instagram and the hashtags they are using. We’ve been eager to see how brands incorporate Instagram into their Valentine’s Day campaigns by partnering with influencers. Especially since more than 50% of consumers celebrating Valentine’s use their mobile device for purchase decisions. Our data specialists ran a quick hashtag analysis of the past week (02/01 – 02/08) to track whether brands come up with clever new hashtag ideas for Valentine’s Day to boost the success of their influencer campaigns. Our Instagram hashtag analysis revealed that only a few days into February, the three of the top 30 most used hashtags were already related to Valentine’s day. But which brands make their followers hearts beat (or click) faster on Instagram? And which branded hashtags get large audiences talking? The NRF assembled some data in an infographic that estimates consumers spend the most — $4.7 billion– on jewelry. That was definitely reflected in our analysis, which found that #watches was the fourth most frequently used hashtag. Watches make great Valentine’s gifts because they combine sentimentality, practicality, and luxury. They can symbolize quality time spent together, they are useful, and they can cost a fair bit of money. They are also easy to promote on Instagram. Our hashtag analysis found three different Valentine’s Day 2018 campaigns on Instagram: Cluse asks the community to share its #cluselovestories, Daniel Wellington offers #dwforeveryone and Rosefield wonders #whomakesyoublush? Event-related campaigns are a great opportunity to assemble some hashtag ideas and pick an engaging one to use as an addition to existing branded hashtags. Let’s check out some metrics for the Rosefield campaign. According to the metrics we can derive from #whomakesyoublush, Rosefield launched the campaign around the 20th of January. Since then more than 800 influencers have engaged with the brand’s content and more than half of them mentioned the brand in their own postings. Using our software, InfluencerDB, we tracked that these mentions add up to an earned media value of $165,685 during the last three weeks and an additional gain of 15.4k followers. Our InfluencerDB monitor feature showed that the hashtag has been used 608 times by accounts with at least 15k followers since the launch of Rosefield’s Valentine’s Day campaign. During the time period of our hashtag analysis, #whomakesyoublush was ranked seventh out of the 30 most used hashtags and generated 94.957 likes — and this data is only for one of the three weeks the campaign has been up and running. Side-note:#rosefieldwatches is ranked sixth in our Instagram hashtag analysis. For their campaign, the brand partnered with a mixture of micro- and macro-influencers like German fashion blogger Sophie van Daniels and stylist Pernille Teisbaek. #Rings also appeared in our hashtag research, coming in at 16th of the 30 most used hashtags in the last week. For a closer look, we turned to a classic jewelry brand, @Swarovski. The company’s Valentine’s Day 2018 campaign continues the brand’s tradition of class and elegance, partnering with several gay and straight couples to celebrate diversity with the message #brillianceforall. Brilliance for All. To celebrate one of the most romantic occasions of the year, #Swarovski brand ambassador @karliekloss and model @andresvelencoso are joined by starry-eyed couples @kimwillecke & @sdubberke, @chiaraferragni & @fedez, and many more, spreading a message of diversity and love with #brillianceforall . Discover more through the link in bio. #brillianceforall is a brand hashtag that Swarovski seems to use for peak events in general and not solely for Valentine’s Day, but Valentine’s Day 2018 has certainly demonstrated its effectiveness. Since the end of January, #brillianceforall has been used 198 times by accounts with more than 15k followers, creating an average media value per post of $2,694. The high media value compared to the few number of hashtag uses is a result of the high-quality influencers Swarovski partners with, like fashion Key Opinion Leader Chiara Ferragni and former Victoria’s Secret model Karlie Kloss. In the last three weeks, the company’s Instagram channel generated an earned media value of more than $1.1m, which is incredibly high, although the brand reached an even higher earned media value during the Milan Fashion Week in September 2017 and during the last holiday season. While lingerie remains a classic Valentine’s Day gift, more and more women are pushing back against letting men decide what they should wear. Victoria’s Secret targets women directly with their #vdaymeday and encourages women to spend this special occasion with their true significant other: their best friend. Several brands encourage friendship and self-love in their Valentine’s Day 2018 campaigns and that trend was reflected in our hashtag analysis — #bff was ranked 22nd in our research, #giftsforher was ranked 28th. Victoria’s Secret has a powerful tool in social media marketing: the company’s Angels have a wide following on Instagram. Among others, they partnered with Danish model Josephine Skriver (4.7m followers) and Dutch model Romee Strijd (4m followers) who took the Victoria Secret Instagram followers on a tour with an Instagram stories takeover. According to the Victoria’s Secret Instagram channel, the Valentine’s Day campaign launched around the 23rd of January. #vdaymeday was used in 141 postings by accounts with more than 15k followers since then and 1024 other influencers mentioned the account during the last two weeks. It’s also remarkable how high-performing the postings with Josephine Skriver and Romee Strijd are compared to the more commercialized posts by the Victoria’s Secret channel. 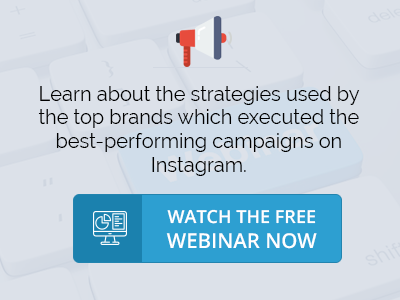 To discover the strategies used by the top brands, watch our free on-demand webinar on the most-popular influencer campaigns. Like Black Friday, Valentine’s Day 2018 is a consumer holiday that can boost a brand’s quarterly revenue, so it’s a great peak event to implement influencer campaigns in your overall social media marketing strategy. Our hashtag analysis highlights that V-day is a hot topic on Instagram. Brands come up with savvy hashtag ideas for their influencer campaigns to create awareness and emphasize the statement they want to spread with their campaign. As the hashtags used by the brands we mentioned show, a spouse or life companion is the not the only one #whomakesyoublush, and Valentine’s campaigns that are more friendship or self-loving focused (like #vdaymeday) also can be successful. The right influencer marketing strategy and clever hashtag ideas can help get the social media audience talking about your brand.